Arthritis is the leading cause of disability in the nation. Could you have Arthritis and not know it? According to the Arthritis Foundation, arthritis is a complex “family” of musculoskeletal disorders consisting of more than 100 different diseases or conditions that can affect people of all ages, races and genders. In my state of Alabama (you can find your state on the arthritis website), arthritis has impacted the lives of 1.2 million adults and an estimated 5,000 children. In the United States 50 million American adults (that’s one in five), have doctor-diagnosed arthritis as well as 300,000 children under the age of 18. And, two-thirds of people with arthritis are younger than 65 years old. So, you can see that this isn’t just an “old age” disease. And, statistics add up to billions of reasons why we must improve our understanding of Arthritis and spread the word. Be responsible for our own care, or others, by sharing information with those we know and love. The already “glum” reality of healthcare costs rising as our economy is stammering to stabilize The Arthritis Foundation is treating this -- – as a serious health related issue, with lots of silver linings if one can learn ways to improve and manage this condition. The sooner , the better. · By the year 2030, an estimated 67 million American adults will have arthritis. · Arthritis and related conditions cost the U.S. economy $128 billion per year in medical care and indirect expenses, including lost wages and productivity. If you ask yourself if there is anything one can do about it – the answer is yes! Under the Evidence Based Health Programs and the Older Americans Act (OAA) of 1965, seniors over 60 may find classes offered in their community given for a small fee, or free. I began my journey as an arthritis instructor with a simple definition but the entire picture is much more complicating. I got the definitions of Osteoarthritis, Osteoporosis, Rheumatoid Arthritis and had no idea that Fibromyalgia, for example, is a related condition, which does not affect the joints. Arthritis means “joint inflammation.” First, look at the structure of a joint. A Joint allows movement however, sometimes, for example, through an injury, one of the sections of a joint, may suffer damage. Inflammation is a natural response to the injury and other condiitons, and it is involved in many types of arthritis, not only through an obvious injury. 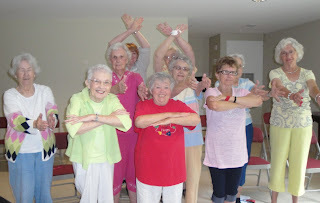 The participants in my class at a local senior complex all “knew” they had some type of arthritis but many had not been diagnosed. Those who were diagnosed and who may have had joint surgery knew exactly what exercises may be harmful or those which may beneficial. As an instructor, I knew I had to remind them to “go at their pace,” and “listen to their body,” before, during and after class. I studiously prepare each class based on the instructions provided me during a long intensive workshop and a number of lessons before becoming fully certified. Week after week class participants return at the senior complex where I taught (ages from 60 to over 90 years old), eager to “work out.” Their life stories are as fascinating as they are vibrant and beautiful. Many have already noticed a difference in how much better they feel and many walk in between days they are not in class. Their age was not a deterrent to successfully complete the lessons. I can confirm that the results after around the 6th class, participants began to feel better by doing the special arthritis class exercises. A few even told me that were taking less over the counter medication and feeling less pain. Good News! These participants in the photo are a sampling of – the real faces of arthritis – which the Arthritis Foundation refers to in their website. The Foundation is doing some work and raising awareness with all the good information and solid research. You'll find nutrition and exercise hand in hand. Ask your family doctor if you might be a person with arthritis? You could be a person with arthritis and not know,it -- but why not find out early so the condition can be treated. To learn more about these vital organizations, their missions and the programs and/or services they provide and the many ways you can volunteer or donate. Or, if you wish to improve your overall health, please visit the websites listed below. *Information obtained through The Arthritis Foundation Workshop and the website. Carolyn M. Rhodes is a certified Arthritis Exercise Instructor and presently a volunteer at the Presbyterian Apartments in Northport, Alabama.